Emilie Autumn’s empowering anthem, Fight Like a Girl, the lead single for her most recent album, boasting the same title as the song., fits perfectly with the predominant theme and struggle for Ada, the main character in this story, who later adopts the stage moniker of “The Amazing Arden,” representing two polarized parts of her inner psychological struggle. Much like the duality present in the title of Emilie Autumn’s song Fight Like a Girl, the more patriarchal/conservative gender view of fight like a girl is more derogatory, while the more empowering sense, embodying a more evolved, mature sense of self/one’s gender identity could see Fight Like a Girl as an assertive, empowering statement. “The Amazing Arden” certainly imbibes unseen power in her stage magician persona. All thanks to my appreciation of Susanna Kearsley’s The Winter Sea late last year, I have proactive in requesting any Sourcebook Landmark novels of interest I’ve been able to find on Netgalley, and this second book that I have read from this fine imprint has only cemented my new-earned respect for the top-notch quality of their fictional offerings. 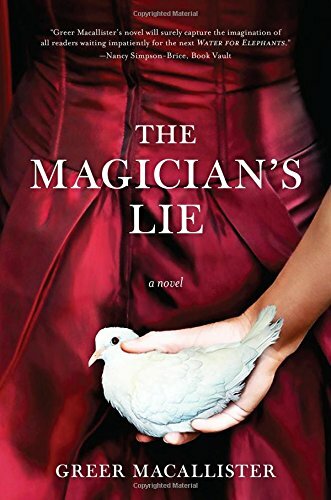 Released last week, The Magician’s Lie, written by Greer Macallister, immediately captured my attention, as the novel’s front flap boasted that fans of Erin Morgenstern’s energetic, colorful novel The Night Circus (another fantastic novel, I highly recommend!) will certainly enjoy this. In a purely facile way, both novels are similar thematically, in that both involve late 19th century/early 20th century aesthetics details , along with a strong circus/magic theme, except the similarities end there since they are entirely different types of stories when you really delve deeper into them. The Magician’s Lie is primarily, or deceptively, from the beginning of the novel, a suspenseful murder mystery.It seemed arranged, at first glance, much like one, as though it were the scaffolding of an elaborate magic trick that even the most circumspect reader will eventually be caught unawares at many stops during the novel, becoming too caught up or emotionally riveted by Ada’s emotionally-drenched tale. Completely enthralled with her story, the main question of the “murder mystery” eludes the reader throughout the novel about whether or not the magician killed her husband or not, during her most popular, divisive act of the sawed-man. The novel starts “in media res,” meaning in the middle of the action, so any of her supposed murderous plans are squelched when a police officer, suffering from the pain and uncertainty of a recent gun wound (which doesn’t seem to heal), arrests her and takes her back to the police station. Since he is suffering from an uncertain marriage and already at a moment of emotional weakness, his “arresting” moment (Get it? arresting moment..) is getting caught up very fast in the moving, poignant, mysterious, and even slightly beguiling story of this wily, resourceful, though sensitive magician woman, who catches the police officer off guard. And the story feels like a tall tale initially, as though it has all the familiar elements of a fabricated tale, like the one from one of my favorite Tim Burton films Big Fish. Yet it is the emotional core of this tale that carries a certain fragment of slight truthfulness, just enough truthfulness to really get the reader attached to the main character of Ada. She is not one-dimensional strong, as many “strong, boring female characters” tend to be, whenever a unskilled writers contrives to write a “feminist” character Also, these types of untrained writers (inept in the art of subtle writing, for sure) tend to make sure to rob away the human vulnerabilities as well, which is such an essential part of the development of a strong, though interesting female character, who has doubts, foolhardiness, short-shortsightedness at times. Essentially, all those growing pains and their accompanying tragedies in life are integral to a story’s construction, allowing the reader to connect deeply with the main character. In a sense, this type of master character development with not just Ada, but many of the other interesting characters, including another favorite of mine like the lead magician/ educator to Ada, Lady Adelaide, also have their own mysterious depth that unravels throughout the course of Ada’s story. The struggle of this character was something that made me fervently hope, from the beginning, that she was not a predictably malicious, deceptive female character, like that of a metaphoric viper, who is really use her beguiling features to beguile us into believing that she is innocent, though in reality she carries the burden of guilt. That trickery is really an essential part of the tale, and reveals a very effective handling of Greer Macallister’s ability to effectively balance two different potential dimensions of this character in a seamless way. I’ve called this the art of subtle writing, where the words themselves are subsumed by the powerful imagery, or dynamic/realistic characters of the tale, till any shred of realism that prevents us from getting too invested in the story. One of the antagonists in the story, Ray, is someone, much like Ada, who appears in the story, as someone you think may be just deeply flawed. He happens to be related to Ada, and they are foils of sorts, in that they both have the same uncanny magical ability of healing. Without divulging anymore specific story details, the way they view their magic greatly shows, where they diverge as characters, and the underlying sense of the reader’s skepticism over who to ultimately trust lies with Greer Macallister’s ability to grant some level of authorial objectivity to the telling of the tale, even if the past memories of Ada’s life are being told mostly through her perspective, so her deploring views of Ray may be prejudiced, or not entirely true. Of course, certain incidences happen in the telling of her tale that will radically change any skepticism at some point, but for the greater percentage of the story, you will struggle over the authenticity of her story. While being a beautiful, evocative novel for the most part, the only detractor for me was the tedious, sometimes glacial pacing of the way that events about the subsequent magic shows and their events are told, sometimes without any compelling melodrama or insightful views into the character. The strongest part of the story is the internal drama of the very dynamic, well-shaped character of Ada, who may be one of my favorite female characters in recent memory. It is her depth, her magnetism, yet her raw, unadulterated doubt and hesitation about everything confusing that is plaguing her life, at many points in the story, that really draws the reader to her story. Her character is really a good example of a well-shaped, interesting female character, who is authentically strong, because the author allows all her nuanced weaknesses to emerge onto the page, while she is struggling with trying to shine in the magic act, or trying in vain to deal with being confident with herself enough to be able to healthfully involve herself in a romantic relationship with someone else. Magically, our reaction to Ada’s tale takes flight, as we grow closer to Ada, and become to fully-realize her as a layered, paradoxical figure, who slowly comes out of the shadows of the darkness of the many doubts and skepticism that both us and police officer hearing her tale project onto the canvas of whatever she tells us. In many ways, the male reader, like myself, has a more interesting role, as we are challenged to look past our own biased patriarchal views that makes us view a capable, strong woman with skepticism, and that she must be some kind of prurient, deceitful viper type woman. But as we let those things vanish and allow that person’s internal depth to open up, we realize our own vulnerabilities as well, as women and men when seated across each other, and talking in depth about different scenarios learn that the supposed “intrinsic differences” become bridged and reflected back to us. Magic, much like gender, is only a mask, a socially-acceptable pretense to hide our scars, our vulnerabilities, our weakness. Instinctively, men are trained to not trust powerful women, and women are trained to see all men sometimes as threatening, because that is what the patriarchal views seem to pervert the most, our ultimate healthy attitudes towards one another. And that is the thing that crystallizes most for me, as a reader (a male reader), who saw this book as much more than something only geared for women. Greer Macallister does a great job including a male listener in the story, and other strong, interesting male characters.while also featuring raw,realistic emotional/romantic drama, with hints of suspense, magic, and even a strong side of tantalizing murder-mystery, to really be the type of versatile read that is all-inclusive of any type of reader. Her book may subtly be making the powerful statement that it is time for readers to stop employing the mental patriarchal-influenced barricade of only reading what is “acceptable” for each gender. This story is for everyone, who dares to open their minds, and listen to anyone they may have a preconceived judgement of, based only on the pretense/preface/pretext of their story. That is only a facile view of the deeper magic and intrigue that lies in story, for those wishing to dig deeper into the story. Sourcebook Landmark is certainly a publishing house I heartily recommend for readers, who want cathartic, edifying, non-gratuitous, though deep historical dramas that are like really moving BBC dramas! If their first 2015 novel starts out this strongly with The Magician’s Lie, I am most certainly looking forward to other forthcoming books from this awesome imprint! Inspiration Behind the Blend/Concoction: When reading The Magician’s Lie, there was always a surreptitious note of mystique, mystery about the character of Ada, fueling the reader’s skepticism about her motives/the veracity of her story about how she become the noteworthy female magician eventually, and whether we really believe she didn’t really murder her husband. This amount of indecision is something that inspired me to cross coffee with tea, straddling the taste boundaries that conventionally govern these dissimilar beverages, and provide something that either hoodwinks you into believing they’re either tea or coffee, or something entirely different. Maybe, you think the whole duplicitous Magician’s Lie brew is a farce, and contains neither ingredient, but something completely artificial. The important aspect that I hope this brew evokes is the same level of depth and mystique that I felt, while reading of Ada’s escapades, the tumultuous emotions of her internal psychological life, while grappling with the struggles of coming into her own, as a magician, an assertive woman at the turn-of-the century, learning to trust herself and others! H While I haven’t ordered any chicory root from there just yet, I have an order in the process, and look forward to get yet another high quality item from them (packaged nicely, as well). Even if the shipping is just a tad bit expensive, you at least know that extra expense helps with this small,private business to maintain a wonderful, ethical working environment. 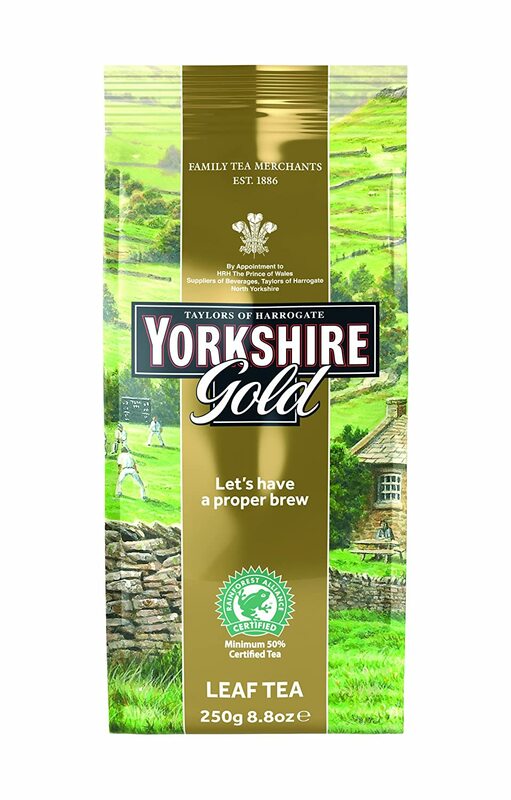 To effectively prepare this concoction, you will need one mug/one measuring cup, each to mix together a different part of this drink, which will be mixed together, carefully, after the Yorkshire black Tea has steeped for 3-5 minutes in a separate measuring cup (More clear step-by-step, easy-to-read directions provided below!). 2) While the water is coming to a boil, measure out 1 tsp. of Chicory Root Powder, a drop of peppermint extract, dash of Sugar in the Raw/Raw Cane Sugar, and a drop of half/half. In the other mug (separate from the one containing the chicory root brew), measure out 1 tsp. of loose black tea (be sure to use a filter, so you can easily reuse the tea grounds, for composting purposes /for a second cup of tea), or just use a one conventional tea bag of any black tea your prefer. Hold off on adding the Tea Honey to the Chicory Root Brew till the water has come to a boil. 3) Once the water has come to a boil, add an appropriate amount of water to the measuring cup, containing the tea. I used a mug, accidentally, when preparing the videos. Fortunately, I had a paper towel underneath. It’s wise to use a measuring cup, for steeping the tea separately, as it will prevent any spills in subsequent steps, which will cause you to needlessly waster cherished Yorkshire Gold Tea. Anyways, steep the Black tea for three-five minutes in the measuring cup, or longer if you wish it to be even stronger than generally suggested. 4) In the other mug, add a tiny amount of water, just enough to properly mix the ingredients for the chicory root brew into a smooth mixture (not something where extra amounts of chicory are left at the bottom), I would say 1/4 of a cup of water, or less is needed for the chicory root brew. Now, get a 1/2 teaspoon of Tea Honey, and put that spoon with the honey on it, into the concoction, to properly stir the honey into the chicory root brew. By the end, it should be a somewhat blackish, coffee-looking mixture, w/ a lighter brown hue, indicating that you used half/half. Basically, it will look like a conventional cup of coffee, as chicory root oftentimes is used by some as a caffeine-free, herbal coffee alternative. 5)After the tea has steeped for the recommended amount of time, carefully pour the tea into the mug, containing the chicory root brew, and stir both of them together, and you should have a deeper, light mahogany beverage, which will smell heavenly. 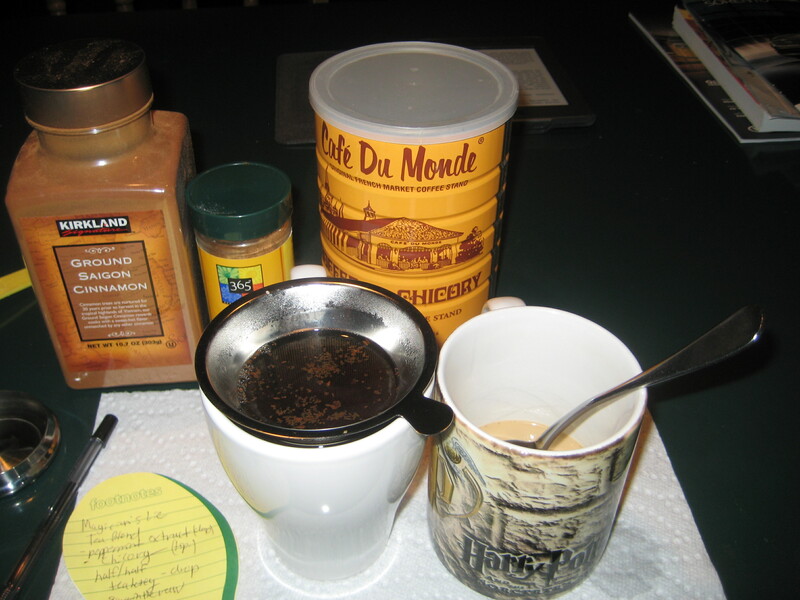 Now, add a dash of Saigon cinnamon and Nutmeg to the top, to give a nice overlay of nutmeg/cinnamon, that float atop your mixture that will deceive anyone to believe it is either coffee or tea. It depends on what half of the brew they’re keenly focusing on, when tasting. Be sure to note that the chicory root brew (being stirred in the video) is in an entirely different mug from the one where the tea is being steeped. This is the second part, where I combine the chicory root brew (with the added ingredients) with the steeped Yorkshire Gold Black Tea. The musical accompaniment happens to be another segment of an Emile Autumn song, called “Time for Tea,” which is the second track of her “Fight Like a Girl” album. Next Post Countdown to “Shadow Study:”Maria V. Snyder Fan Questions and Answers! You’re a lot more inventive with your tea recipes than I am, Justin! Although I got an idea recently after visiting Adagio Tea’s website. They let customers who have purchased tea from them before create their own blends using a number of Adagio’s teas. 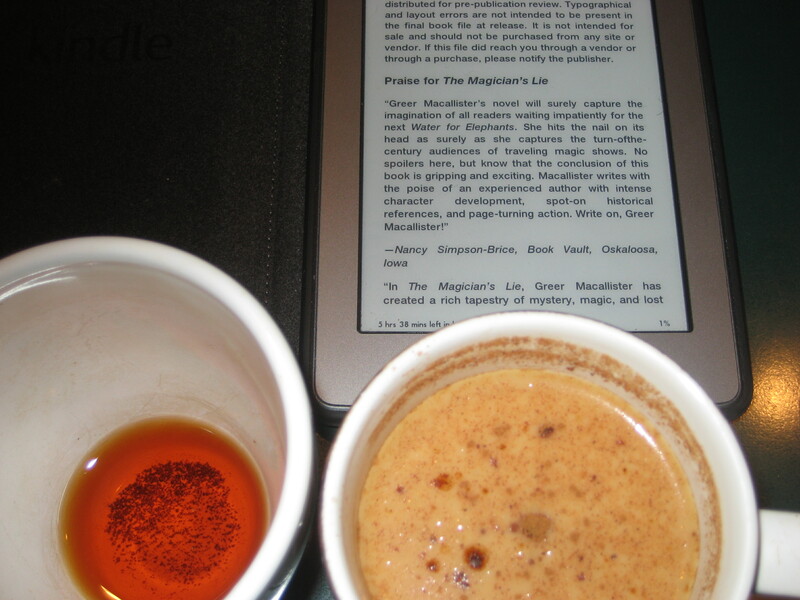 I think it might be neat to create a line of tea blends to go with my book (once the book’s released, of course). So I’m going to start experimenting with their teas this year and see what I come up with. The Magician’s Lie sounds like pretty good, a mix of historical fiction with mystery if I’m not mistaken. I’d read another fairly positive review of it… can’t remember when, but it had to have been in the past month or so, and it caught my attention then. So I might have to read this book. I’m doing sorta of the same thing w/ Chronosphere, except I plan on buying some teas and stock herbs from Mountain Rose Herbs (my favorite online store for such things). I am aware of Adagio Tea’s self-creation tool, and may use that for another project. It’s pretty fun, though I kinda want to craft the tea tins myself (w/ cool labels) and add the mix myself, which will be sold alongside the cool paperback edition. I just need to get the first draft done before April 1st, because that is the due date for submissions for a small Steampunk press, started up by a freelance editor I know fairly well. Also, yes Magician’s Lie was a great read, with a nice combination of historical drama, with some hints of well-executed mystery. It kinda has a “Poison Study,”/Yelena vibe at some points, which was really cool to see in a historical drama/mystery.